You have been called to a MET call to assess a 68 year old lady who is haemodynamically unstable during her dialysis. The episodes are intermittent; each time dialysis begins, her blood pressure falls to 50/30 and she is presyncopal, but on ceasing dialysis, her blood pressure returns to her normal 95/50. She has otherwise been well recently, no medication changes, and her dialysis weights have been stable 72Kgs. Her background included ESRD 2nd DM, IHD with mild LV dysfunction, hypertension and polycythaemia. 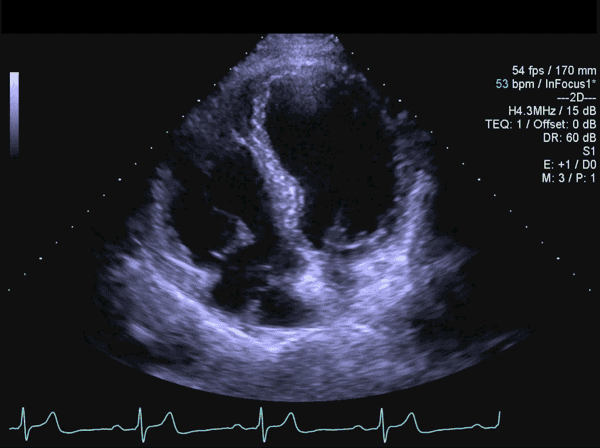 You perform an urgent echocardiogram…..
TTE Apical 4 chamber. Left and right ventricular size and function overall normal. Within the RA is a large, mobile mass adjacent to the TV. RV focussed view showing the mass appears to fill the majority of the RA, and is abutting the tricuspid valve, though is not prolapsing through it. The tricuspid valve apparatus does appear to be opening but closure may be somewhat compromised. The exact origin of the mass is not clear, but is suggestive of the posterior wall. 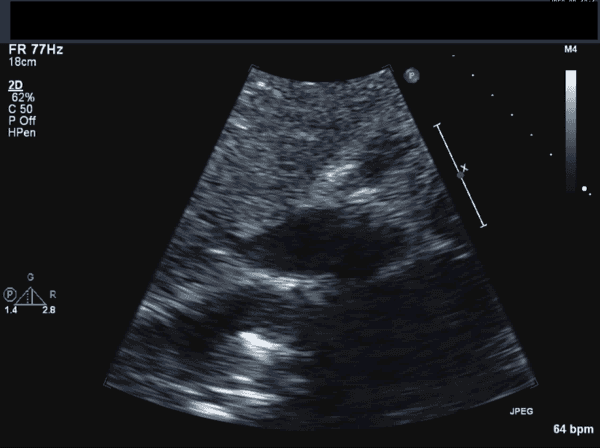 Note on the subcostal view, the mass appears to be just visible at the IVC/RA junction, although the IVC is otherwise patent. 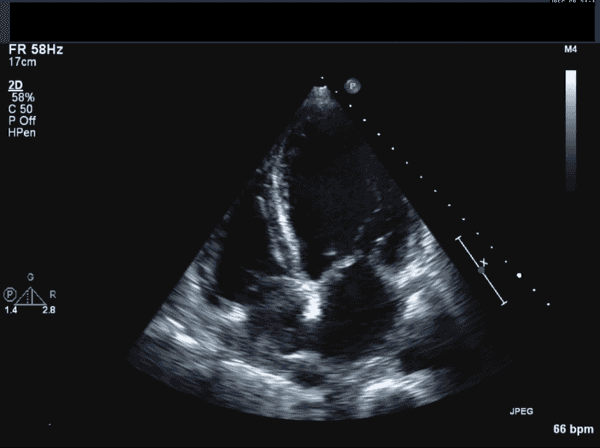 Right Atrial masses are a common echo finding, and deciding what they are can be challenging. The first step is deciding if they are real, or ultrasound artefacts. Imaging the mass by zooming, panning through the mass, and in multiple planes may help. Masses occur throughout the cardiac cycle, in the same region of the heart, while artefacts come and go and are usually not multiplanar. Many masses are normal variants, such as the crista terminals (fibromuscular ridge from the postero lateral wall of the RA) or the chiari network (evolutionary remnants of the Eustachian valve which are typically mobile, thin, linear, at RA/IVC junction and can cross the fossa ovalis but don’t cross the Tricuspic valve) or aberrant trabeculae. However thrombus, tumour or vegetation may all appear similar on echocardiography, and these important disease processes must not be missed. Apical four chamber TTE showing well developed Chiari network in the right atrium. As has previous been mentioned in this post on intracardiac masses, it is important to look at the location, mobility, shape, attachments, as well as the patients clinically status and what is more clinically likely. Sometimes TOE or Cardiac MRI can be used to further investigate. Primary RA thrombus is rare, and more commonly the source of venous thrombi are emboli that have become lodged in the tricuspid valve apparatus or RV trabeculations. Thrombosis also common forms over indwelling devices, such as pacemaker leads, and central lines. Pacer wire, Swan Ganze Catheter or CVC. They key to this patient was the intermittent nature of her HD instability. During dialysis, the reduction in venous flow in the IVC was causing the mass to totally occlude the tricuspid valve, and thereby causing obstruction to flow and hypotension. The patient was given some intravenous fluids with improvement of her haemodynamics. She was commenced on anticoagulation. 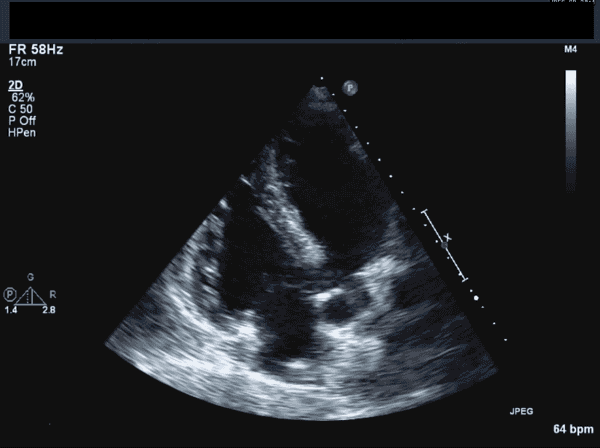 Serial echocardiograms showed the mass slowly reducing in size. 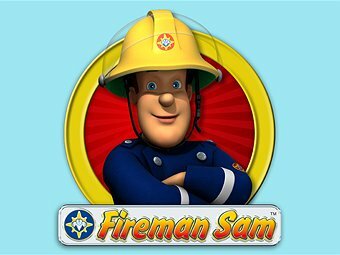 *Otto. Textbook of clinical Echocardiography. Pub 2009.